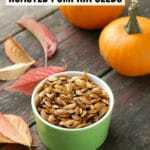 Home » Appetizers » Roasted Pumpkin Seeds: The Best Method Ever! 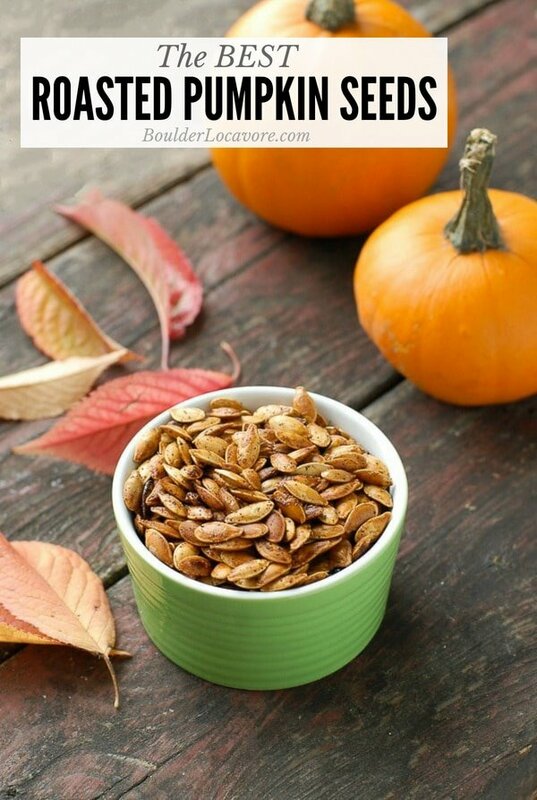 Roasted pumpkin seeds are the best part of carving pumpkins and this BEST METHOD includes a life-changing trick! Eating roasted pumpkin seeds is great. Getting them out of the pumpkin through the roasting process is not. Am I right? Grabbing them is like participating in a greased pig contest at a rodeo. But NO MORE! No more wrestling with slimy pumpkin goo thanks to a simple, secret trick! 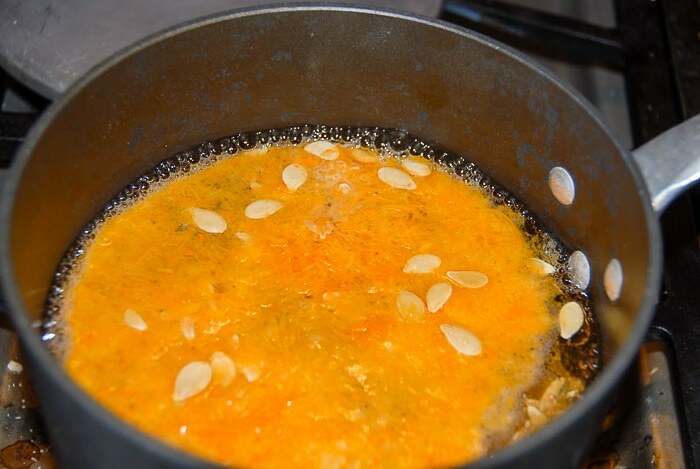 It’s a fast and easy way to get fantastic roasted pumpkin or squash seeds every time with little effort. Boil the seeds in salted water first. How will that make a difference? It separates all the pumpkin membrane from the seeds freeing them to easily be roasted. All that time trying to pull away the slippery pumpkin goop? The boiling takes care of that. I also think the salt water plumps up the seeds so when they are roasted they turn out with an incredible texture and flavor. 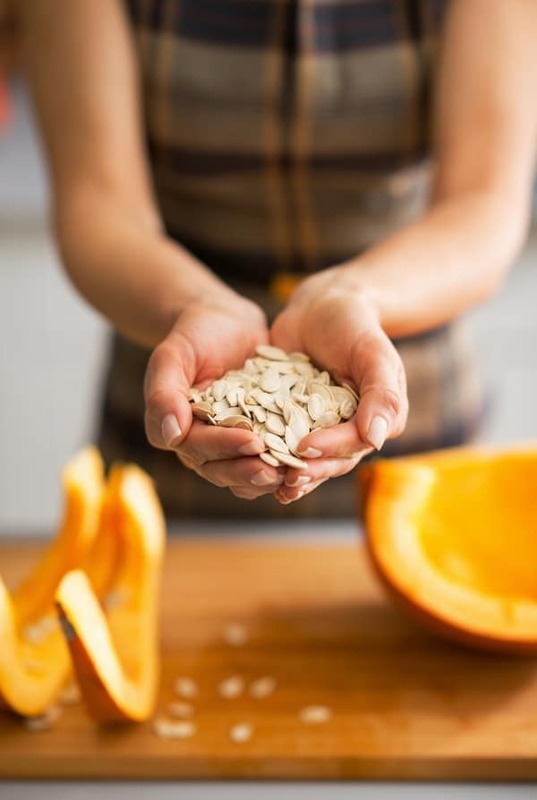 Use this Method for All Winter Squash Seeds! 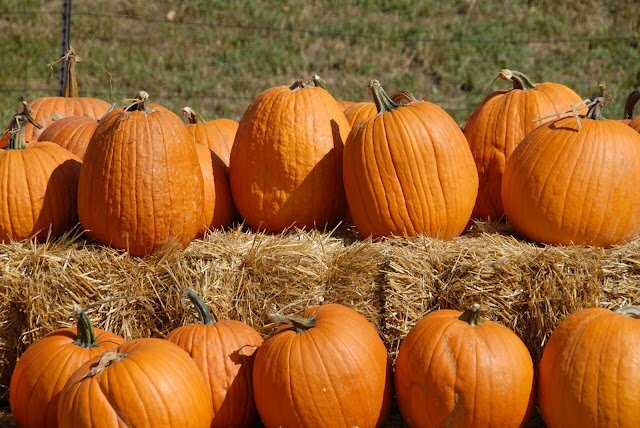 Somehow, it’s only the pumpkin seeds that tend to get roasted and only from the Jack-o-Lanterns carved for Halloween. 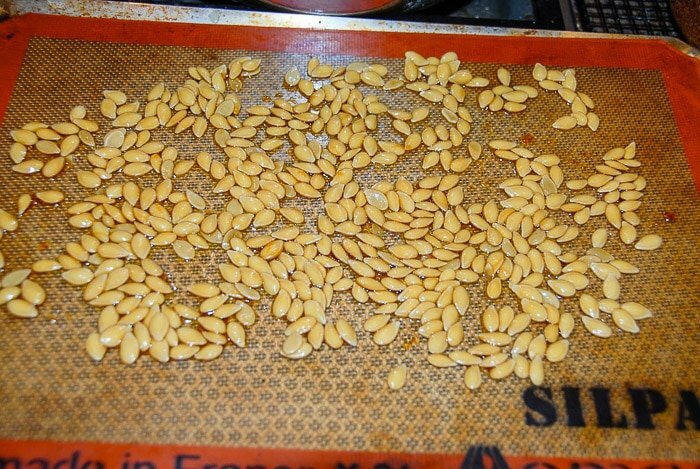 This method is perfect for all winter squash seeds. 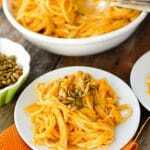 Making some Butternut Squash soup (or Butternut Squash Noodles in Sage Brown Butter)? Don’t throw away the seeds; roast them. 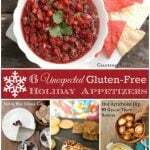 They are delicious for snacking but also great on salads, to top soups, tossed on granola and many other foods. Even if you have hours to dig through the pumpkin membrane to release and roast the seeds, they generally don’t come out great. They can be thin, hard to crisp up for a nice crunch and lack flavor, or taste ‘green’. By pre-boiling the seeds have begun to cook before the roasting. Roasting in the oven really finishes them and crisps the outside to a pleasing texture. It’s like night and day from traditional roasted pumpkin seeds; trust me. What do Roasted Pumpkin Seeds Taste Like? Seeds roasted through this method are incredibly delicious; very nutty and bursting with flavor (I actually find them to taste a bit like bacon). These seeds had a few sprinkles of Ground Chipotle Chilies along with the salt and pepper before roasting. 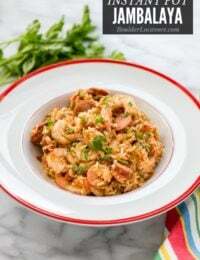 They are delicious with some smoldering heat and smoky flavor. This is the fun part. Seasoning the roasted pumpkin seeds can be anything you love. Salt or salt and pepper alone are delicious. Do you have a favorite spice? Try it. The roasted pumpkin seeds in the photo have a few sprinkles of Ground Chipotle Chilies along with the salt and pepper before roasting. 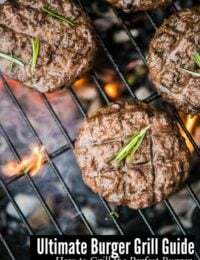 They are delicious with some smoldering heat and smoky flavor. Sprinkle the seeds with some soy sauce or Tamari (if gluten-free) before roasting for salty Asian twist. 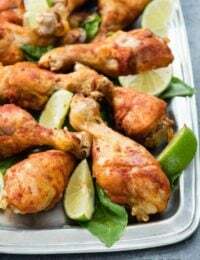 Cayenne Pepper is great if you love some heat. Sumac has a citrus flavor along with a Middle Eastern taste. 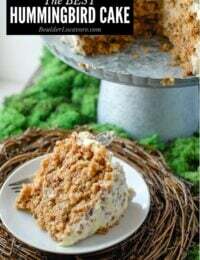 You could even change it up and try some fine grain sugarfor a kettle-corn type flavor. 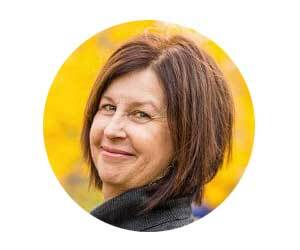 Scrape the seeds from a partially cooked or uncooked winter squash. TIP: using a pumpkin scoopermakes the job easier. Seeds are rinsed to remove large pieces of membrane. The oven is preheated to 400 degrees and a large pot of salty water is brought to a boil. The seeds are boiled for 10 minutes. 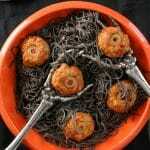 The seeds are strained in a colander and any separated bits of pumpkin removed. Seeds are added to a mixing bowl and tossed with olive oil, salt, pepper or desired seasonings. The seeds are placed in a single layer on a prepared baking sheet and baked to desired doneness; 10-15 minutes. 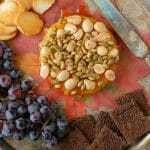 Allow seeds to cool then devour! The seeds change from the wet, grayish color to more of an opaque white then golden brown as they become fully roasted. Need some pumpkin carving inspiration? Try these 11 Unique Pumpkin Carving Ideas! 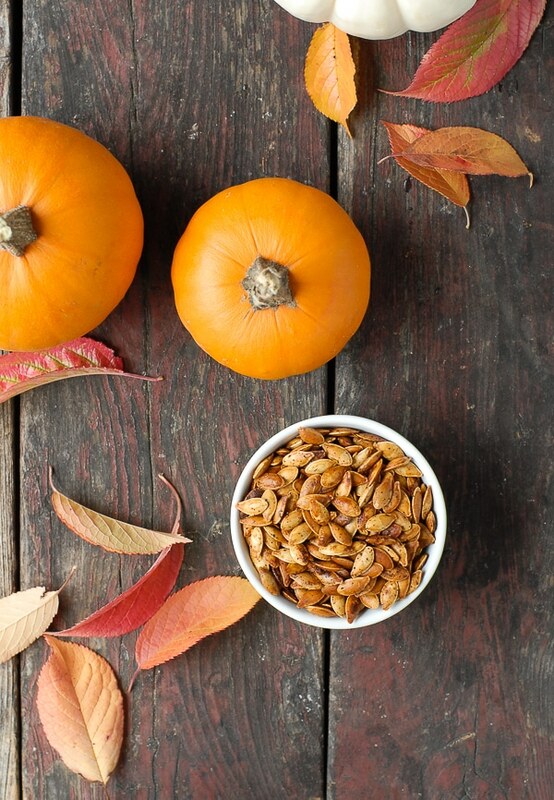 If you’ve tried this BEST Roaste Pumpkin Seed recipe please RATE THE RECIPE below! 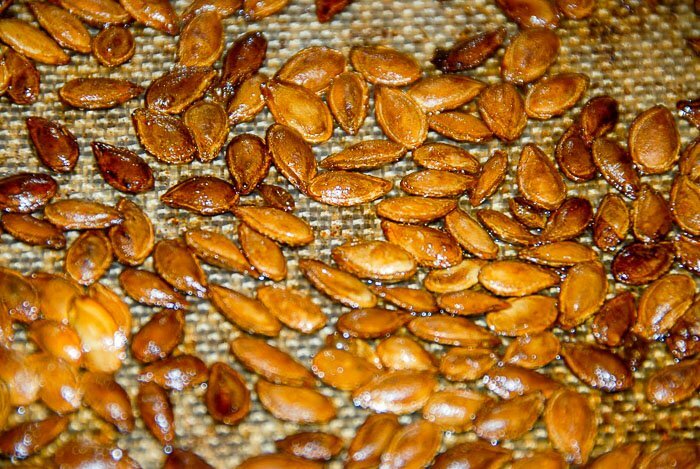 This roasted pumpkin seed recipe has an extra step of boiling the pumpkin seeds before roasting which easily removed the membrane and plumps the seeds for fantastic results. 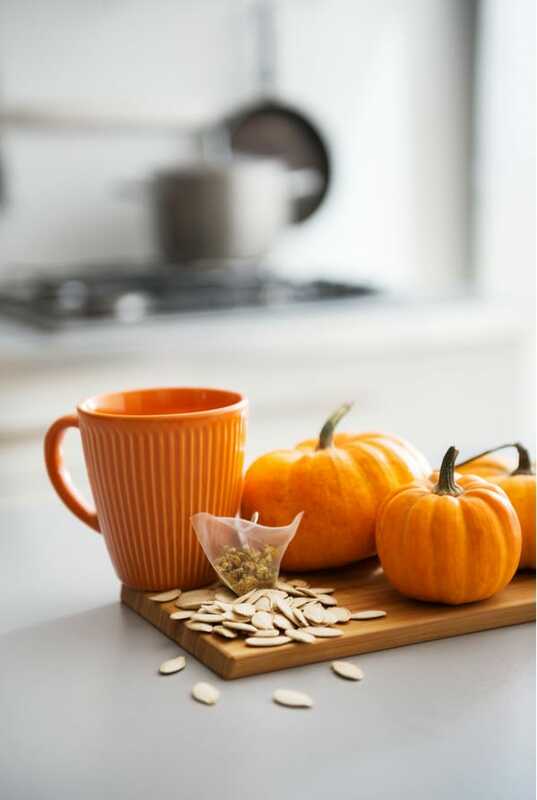 Scrape any squash seeds out of a partially cooked or uncooked winter squash. Rinse the seeds to remove the major chunks of squash or any strings possible. NOTE: The boiling separates most of it; this is to remove anything large. Bring to boil a few cups of water; about 2 cups of water to 1/2 cup of seeds. Add ½ teaspoon of salt per cup of water. Note: the amount of salt may be increased or decreased to taste. Boil for 10 minutes. 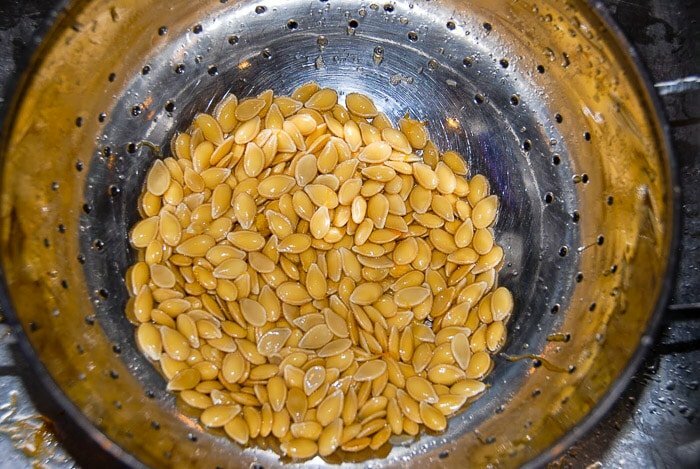 After boiling, return seeds to a colander and rinse. 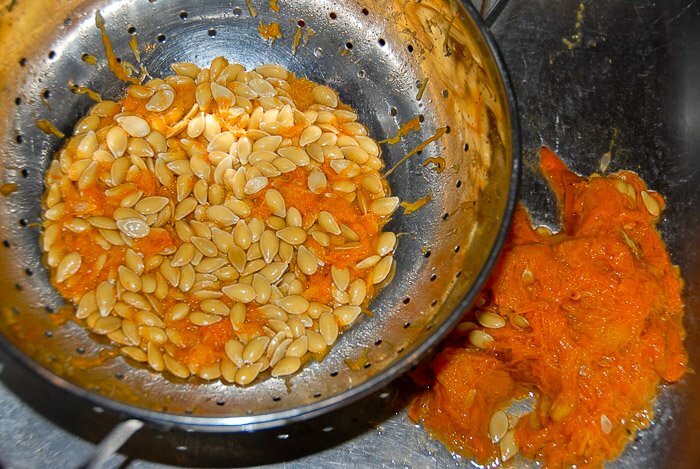 Any remaining pumpkin particles or string will have separated; remove them from the seeds. Put the seeds in a bowl. Toss with 1-2 teaspoons of olive oil to coat the seeds and add salt and pepper to taste. Additional seasonings and spices may be added. 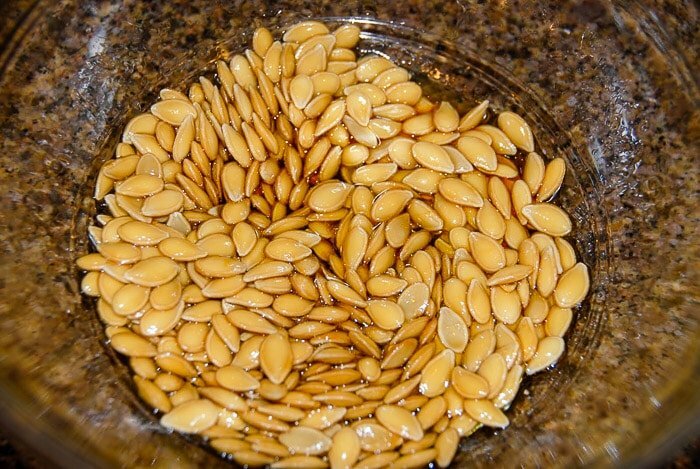 Spread seeds in a single layer on a baking tray or in a shallow roasting pan in the upper portion of the oven. Bake until seeds begin to brown and are a consistency of your liking; 10-15 minutes. Different size seeds may take different lengths of time to cook. TIP: the seeds change from the wet, grayish color to more of an opaque white then golden brown as they become fully roasted. Leave the seeds to cool on a rack until you can safely handle them. this is delicious to boil first. Hard to save some for tomorrow to let my caregiver taste. She had never cut a homegrown pumpkin before.and was off work before I roasted it as well as made seeds……yummy thank you. 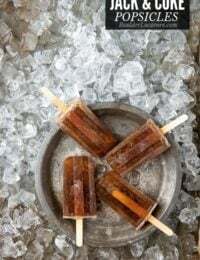 I still adore sharing a new food, that some folks in later years never experienced. Pretty good! I boild with Jalapeño Sea Salt. and for seasonings: more sea salt, cayenne pepper and the True Lime Cilantro Garlic Seasoning. Ooh yeah!! 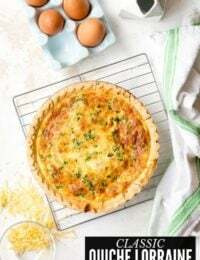 I loved this…however I didn’t read that you were only supposed to boil them for 10 minutes until they had already been boiling for half an hour…thought I had ruined them because they went very grey but I decided to soldier on and do some experimenting. I put olive oil all over all of them and then separated them into four bowls and I did one bowl with just seasoning salt, one with worcestershire, one with Valentina’s hot sauce and one with Tamari. I had to bake them for 40 minutes stirring every ten minutes or so but they turned out AWESOME. Thank you. I never would have thought of boiling them.